The first game following the end of the transfer window, whatever your thoughts on how we handled the window, these are the players we have to take us to the end of the season and probably we will not have a change of manager, so we need to back them, what does seem to have been overlooked is the fact we have started to play better over recent games. We got to The Vine Pub at 12.30, a massive pub with a 50/50 split of Saints and West Brom fans, some great chats about past games and of course Cyril Regis. Did the 20 minute walk to the ground along side unfenced train rails, there was a great tribute to Cyril before the game in which Saints fans were magnificent in their respect. Second half starts, Saints looked very comfortable Great chance for Saints as Boufal's ball finds Carrillo who flicked the ball over Foster but it was deflected for a corner. Good to see that Boufal was the first player to congratulate Ward-Prowse for the goal. 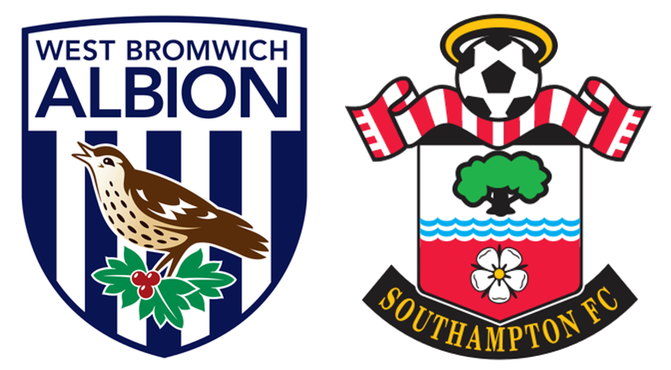 On the hour West Brom bought on Jay Rod for Sturridge, who had shown some quality but was really not match fit. Saints came close to a fourth but Dawson got just in front of Carrillo to concede a corner. Good to see that Saints didn’t panic after the goal, just carried on playing with confidence, Shane long came on for the totally shattered Carrillo, within minutes Cedric put a great cross for Long who had a total free header just a few yards out but somehow put it over the bar when it looked far easier to score. If Saints can reproduce playing with this confidence, they will not be going down.